*It looks like the makeout session between Chris Brown and Rihanna at a New York club this week wasn’t just a one night thing. The two were reportedly spotted together at Jay-Z’s concert in Brooklyn Wednesday night, where the two appeared to be cozy with each other. Late Wednesday night, Rap Radar editor Elliott Wilson tweeted a photo of the duo sitting next to each other at the VIP area of Barclays Center, where Jay-Z performed. 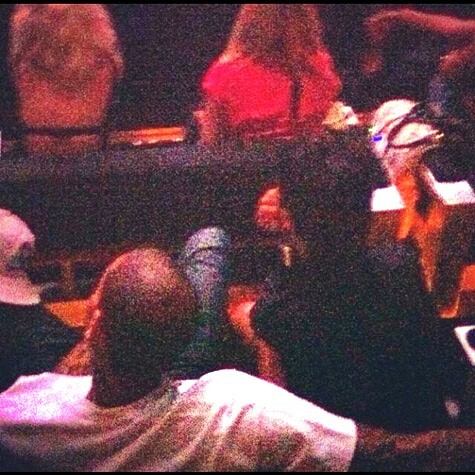 There, Breezy could be seen putting his arm around the back of Ri-Ri’s seat as they reportedly sat behind Beyoncé and Rita Ora. Other concertgoers have verified the sighting as well, via various social media outlets. Earlier in the evening, the duo were also snapped making separate exits from Manhattan’s Gansevoort Hotel in seemingly the same outfits they were wearing at the Jay-Z show, with Rihanna stepping out moments after Brown, reports E! Online. Brown remains on probation for his 2009 beating of Rihanna. Last week, a judge refused to revoke the R&B star’s probation after he tested positive for marijuana. Previous ArticleThe Love Lifestyle: You Are Not Superwoman! Uuuuuuuuuuh HUH!!!! Just let it goooooe & realize haters that…..she doesn’t hate dude & her actions/getting back with him, is consistent with the fact that he’s NOT a “monster” & she?…..knooooooows that. I DO feel empathy for those who have been through similar circumstances, truly!!! But the dude “you” were with?, may have BEEN the monster, but he wasn’t “Chris Brown”. Chuuuuuuuch! Somethimes this is what it takes….time and patience to grow up and realize some thangs….good luck on a healthier, happier relationship Chris and Rihanna.